The summer residence of the British now developed into one of the most visited tourist places of West Bengal. Darjeeling- Queen of the Hills is a small hill station situated in the Mahabharata Range or the lesser Himalayas at an alleviation of 6710ft. Although a small town, but Darjeeling have some of the most breathe taking views of the mountains. The Kanchenjunga which is the third largest mountain of the world can be seen most prominently from Darjeeling. The tea gardens of Darjeeling are famous for their aroma and tastes. 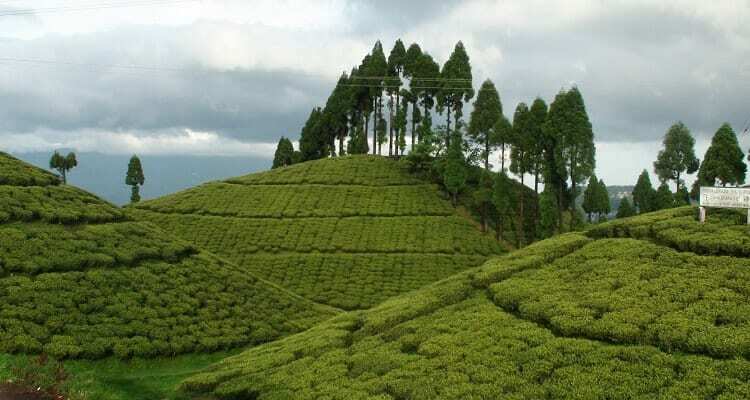 The best time to visit Darjeeling is March- April or from September – November. The people in Darjeeling are very friendly and helpful. Tourism is the most common business there. In this section I have discussed the top 10 places to visit in Darjeeling which includes gardens, monastery, scenic places and markets. One can book a cab which are easily available everywhere in Darjeeling or can book one with their hotel. Darjeeling is famous for its tea. So just go any tea garden and see for yourself the how it is cultivated. You can visit any tea garden you wish without taking any permission. The farmers will be more than happy to welcome you and show you their garden. They may even brew you the tea from that garden. Built in 1959 for the Tibetan peoples whofollowed Dalai Lama and escaped their country. The place consists of a shop with all handmade clothing, carpet and leather items. The place also provides residence for the Tibetan people. About a distance of 10km from Darjeeling you will be finding the rock garden. True to its name, everything around here is carved from rock. The most beautiful carving among them is that of a tree with birds. At the center of the garden you will be finding a magnificent natural water fall. Located about a drive of 10 min from the Darjeeling central is this peaceful place. After entering you will feel that you have entered a different realm. The place very beautiful as well as peaceful. You will be entering through the Japanese temple which has the preaching’s of its founder. It has two prayer rooms. After that you will be going to the peace Pagoda which depicts the preaching’s of Lord Buddha. You will find many idol of Lord Buddha there. While doing the ‘parikrama’ i.e. taking a walk around the shrine you will be able to see the scenic beauty of the Town. Located at the highest point in Darjeeling and in the military camp area. It is best known for its sunrise view of the Kanchenjunga and is a must visit. On a clear day you can even see the Mount Everest from here. You have to get up at 4:30 am and take a cab to reach there. It is 11 km from Darjeeling and takes around 40 minutes to reach there. They both are located at the same place. You can take a cab from your hotel and can reach there. The Zoo apart from the normal animals that we see in any zoo, have special Himalayan animals like the red panda, snow wolf, snow leopard and many other birds. The HMI is a school for mountaineering students. It was established in honour of Tenzing Norgay and Edmund Hilary. It also has a museum for the tourist and consists of a wide variety of mountaineering instruments and everything needed for mountaineering. Rising from the Mall roadis a waking way to the Mahakal Temple. The road up to the temple is very steep. But after reaching to the top at the temple you will feel utmost satisfaction as it provides a 360 degree view of the whole Darjeeling. After arriving in Darjeeling, you can go directly to the mall road. It is a market. Most of the hotels are situated around the mall road. The roads covered on one side by mystic trees and on the other breathe taking view of the mountains. The road has some of the fine restaurants and bakery aged back to the British India. The road has also some shops with junk jewellary, winter clothing, footwear, mountaineering instruments and junk food stalls. The momos are a must try among food. As the name suggest it is a loop where in the toy train takes a tour. It consists of manicured gardens with streams and fountains. You can get a wide view of the mountain range of the Kanchenjunga from here. The toy train connects the Hills with the plains.It was declared a UNESCO World Heritage Site. While coming to Darjeeling the Toy train is the best means. You can view the flora and fauna of this place and enjoy the whistle of the one of the few steam engines left in India. The ride of the toy train is very pleasant and beautiful. The train starts from New Jalpaiguri Station. During its journey it crosses over 5 major and 500 minor bridges. The train passes through the tea estates also where one can see the women plucking tea leaves the steepness of the hills. The most wonderful view is that of the Batasia Loop where the train takes various loops around a wonderful garden with a view of the Kanchenjunga at the back ground. The train halts here for 10 minutes.